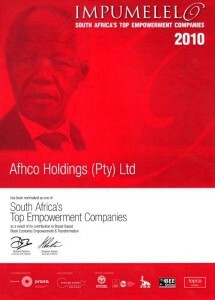 Afhco is a company that strives for excellence, enriching its stakeholders and realising profitable investments. The turnaround of Lister Medical Centre, Jeppe Street. Private medical facilities and theatre services are provided weekly to over 7 000 patients. The building was sold in 2011. Purchase of in excess of 300 apartments in Friendship Town, Commercia ext 9, Midrand and the successful management of the Friendship Town Village, of over 650 housing units. The conversion of Castle Mansions from vacant commercial space into 123 apartments. This was a first for the City of Johannesburg. Employment of deaf employees and the start of the learnership programme. CityKidz Pre and Primary School, an Afhco Group social initiative opened its doors in Mooi Street. This currently serves 390 learners. Afhco’s Inner City Ambassadors, in partnership with SAPS, starting patrolling the streets. The start of the conversion of 120 End Street in New Doornfontein from an empty commercial building to 924 residential units and an 8000m² shopping centre. This is the largest conversion of this type in the Southern Hemisphere and the largest shopping centre to be built in the Johannesburg inner city since the Carlton. The recovery of Barclay House, a previously hi-jacked building, in order to upgrade 154 residential units. National Business Awards: 2010 Sustainability and Beyond. Start of the upgrade of End Street Park in association with JDA. JHB Central SAPS Annual Top Cop Award – Certificate of Appreciation. Halala Joburg Awards “Caring Joburg” for CityKidz Pre & Primary School. Halala Joburg Awards “Living Joburg” for Sambro House. 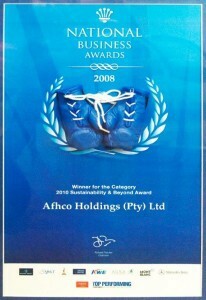 Halala Joburg Awards “Living Joburg” for Cavendish Chambers. Winner ABSA Jewish Achiever – Non Listed Company Renney and Wayne Plit. Official opening of the roof top vegetable garden at African Diamond, a partnership between Afhco and JDA. Halala Joburg Awards “Living Joburg” for 120 End Street. Halala Joburg Awards “Believing in Joburg: the Stan Nkosi Award” for Renney and Wayne Plit. Signed R150 Million affordable housing funding deal with Agence Française de Développement (AFD) for much needed communal housing in the inner city, to develop 1100 low cost housing units. Partnership with The Inner City Football Club, an NGO that offers counselling for parents with children under the age of 7. Completion of Atkinson House and Platinum Place of 1100 low cost housing units. Currently converting Stuttafords – a Heritage building – into new middle income housing units.